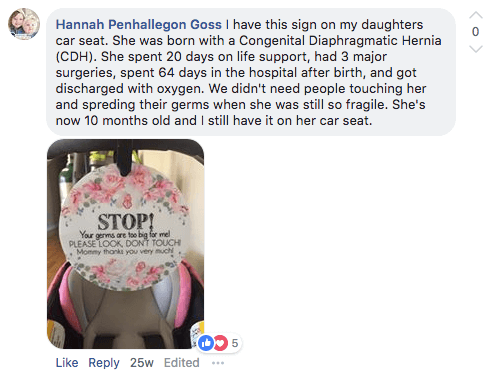 Flu season has arrived my friends and parents are turning to a new trend of posting a ‘do not touch sign’ on babies’ car seats for ALL the right reasons. One child has already reportedly died this week after contracting the flu, and this is only the beginning of what is to come. The flu death toll in America last year was the highest in four decades with over 80,000 total deaths, and more than 900,000 hospital visits reporting flu-like symptoms, according to the Centers for Disease Control. The CDC recommends that those 6 months and older get a flu vaccine before the end of October. 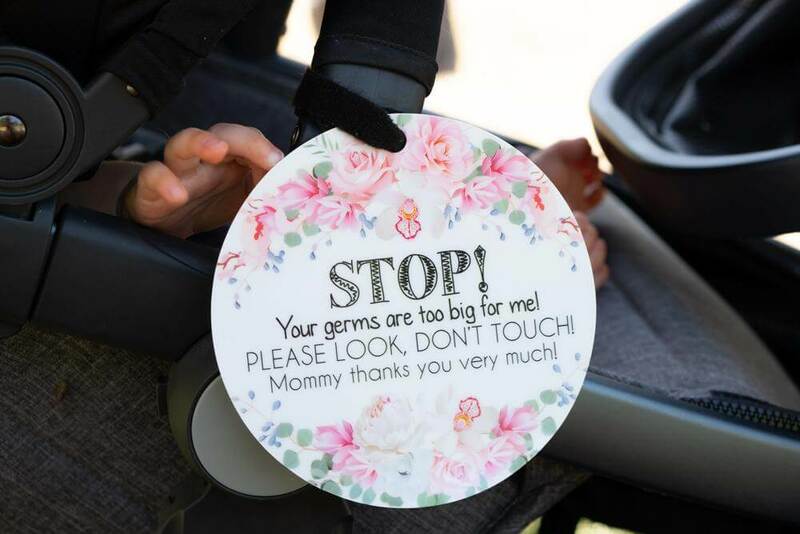 Parents of infants are taking things into their own hands to ensure those delicate little babes, stay safe from other peoples’ germs. 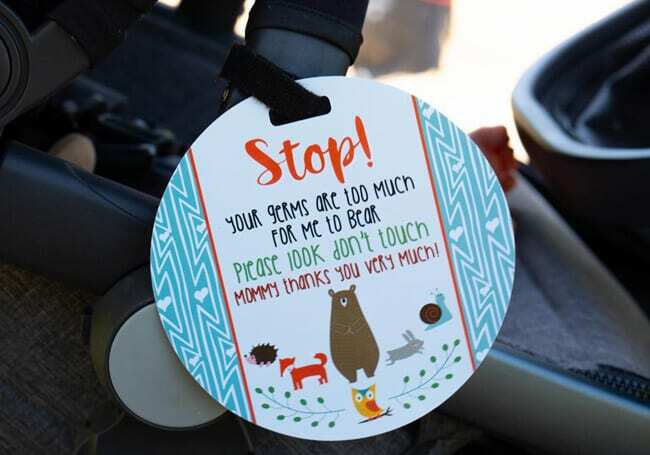 A new trend of “No Touching” car seat tags have BLOWN UP on Etsy in recent months and they’re getting a mixed reaction from the parenting community. 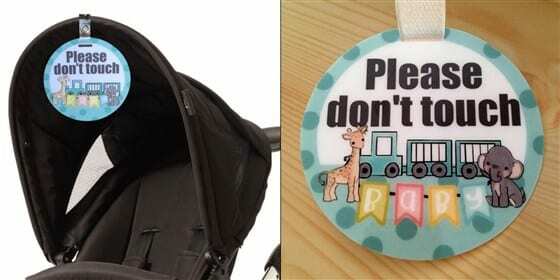 The signs, which are meant to be hung on car seats, strollers, and even outside of hospital rooms, are the polite and fun way to ask strangers not to touch their baby. A baby’s immune system isn’t fully developed until their second or third month, which leaves infants and those under 6 months of age at an extremely high risk of contracting infection and deadly flu viruses. They can’t be vaccinated, and often times can’t be treated with powerful medications like older children. 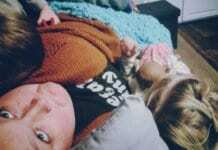 Of course, the parenting trend has garnered plenty of *thoughts* from those across the internet. The use of “No Touching” car seat tags has actually become a debate on several Facebook feeds, particularly that of Breastfeeding Mama Talk. Earlier this year, the popular mommy blogger turned to her 1.1 million followers, asking if they would ever use one of the car seat tags. Thoughts? Would you put this on your baby’s car seat? Several parents were quick to chime in with criticism and snarky eye rolls, arguing that kids need germs to build their immune systems. While this may be true, most experts would argue that infants and newborns are the exception, as their immune system hasn’t even fully developed yet. But despite the vocal slander of Facebook, these things are selling like hotcakes. And some other parents shared why these little tags are actually a life saver. Truly, they could actually save a child’s life. Children who were born as premies or have compromised immune systems are at an even greater risk of contracting viruses in which they are indefensible. No child (or parent) should be stuck fighting off illnesses from other people – especially when they can be prevented. One of my best friends’ BABY is constantly sick because her husband is a pastor and all of the teenagers at church are quick to rub up on her cutie son. Even the most harmless little touch can transfer germs that may not effect teens and adults, but have long-lasting and dangerous effects on fresh immune systems. The bottom line is this: If it’s not your child, ask before you touch. Parents are allowed to have their preference of how much interaction their baby gets with strangers. And as civilized people, it’s our job to respect a parent’s decision, not criticize their methods in protecting their baby from germs.